By Nick Howell on 09/26/2013. This is a moment-to-moment account of my day’s dealings with the CA DMV. It is one of my most painfully epic experiences to-date. For those of you that live in LA, this is simply going to make you chuckle, because you get it. 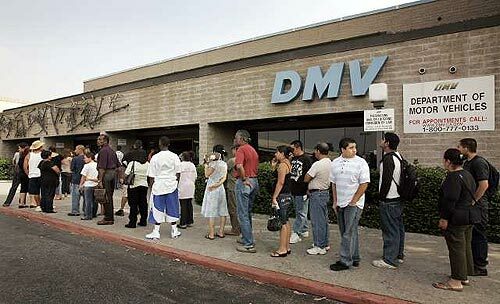 For those of you that have never dealt with DMV in a major metropolis such as Los Angeles, grab a tasty beverage, sit back, and relax, and enjoy the tale of my day. In July 2013, I relocated back to Los Angeles from North Carolina. Having lived here for many years before, I knew what lie ahead of me in dealing with the DMV here. But I had been through the motions before, and knew what I was doing. Now, for some back story, it’s worth noting that I lived in LA as recently as March 2011, when I relo’ed to NC. Why is this important? Well, my CA license is technically still legit, and I was able to get a NC license upon moving back. More on this in a bit. Also, it’s worth noting that CA, in order to decrease govt spending, has furloughed many govt employees, and some of the hardest hit have been the DMV. To put it in perspective, the state only compounded an already out-of-control problem by limiting the amount of time each person could work per day, and how many employees could be on staff at any given time, on any given day. Perspective? Imagine 250 people waiting in line to get the attention of 2 employees. That’s important because between August and September, I have made 3 separate attempts to show up ad hoc [like everyone else] only to be greeted by lines, and told that I wouldn’t get helped today. Yes, I’m stubborn. I finally succumbed and scheduled an appointment. First available slot? A week and a half away. Today. My friends, that is where it all went south. I have two cars to register and get plates for, as well as simply getting a “reprint” essentially of an existing driver’s license. It’s important to note that these are treated as three separate items. More on this later. So I stack up all my forms, and the rest of my packet of crap, take her clipboard, and head BACK out to my car. EIGHT CARS ARE IN FRONT OF ME. No one went to the front car for 15 minutes. Apparently, the person verifying is the same person doing the ride-along driving tests. Finally, two people come out, as if they’re reinforcements, and begin expecting cars. 5 minutes? Try 50. 50 minutes I’ve just spent in this line. And it took 15 for this woman to “Verify” my car. Anyone want to take a guess at what the “verifying” process is? Remember that form I had to fill out for registration? Same. exact. form. All I could do was laugh. Great. So I re-park the car, which takes another 10 minutes to find an open spot. They really should put a four or five story parking garage in there. Once parked, I walk back in to the counter, wave at the nice lady who served me forms, and handed her my reg form and verification form. Even she had trouble for a second determining which was which. She stapled them all together with a number. F064. …and they did. At this point, I’m still very excited that I’m skirting [to an extent] around the MOBS of people, and it’s always nice to feel like you’ve gamed the system. All things considered, this could be a lot worse. My number is called, and I go to the assigned counter. I’m greeted by the most indignant, disgusting, dirty-clothes-wearing, sloppy Hispanic woman. If she were pushing a cart down the sidewalk, you’d think she was homeless. But I refused to get personal. I smiled, asked her how her day was going, and let her know that I was previously a resident, and was simply returning to the state and registering cars and getting an updated license, which should still be valid. …and she walked away from the desk, leaving me “WTF’ing” to myself. After about 5 minutes goes by (seriously, I replied to three lengthy emails in the time she was gone), she comes back and says, “I had to get approval from my manager to do more than one item, since everything is timed, and your ticket #F064 says there’s only one item.” Turns out her manager was the one that handed me the forms in the first place, as well as the number. Stew on that for a second. Let’s reflect. I arrived at 11:20AM. It was pushing 1PM at this point, and I am just getting to the counter with my paperwork, WITH AN APPOINTMENT. Stew on that for a second. She quickly goes through the car’s paperwork that got verified, as everything was in order. I believe the only hiccup was getting the lienholder’s address correct. No biggie. Next, she begins to process the other car, which I did not have with me. Again, address correction of the lienholder needed. Nothing Google can’t solve. She gave me an indignant F-U smile as I turned and walked away. Yes. I walked out of the DMV, having lost over two hours and written a check for more than $700, with neither a driver’s license, nor a plate for either car. It was at this point, that I decided enough was enough. I abandoned the DMV process altogether, and headed home. But not before treating myself to some Bacon Cheddar Wedges at Jack in the Box (Seriously, they’re like crack) while continuing to contemplate three hots and a cot, and life in the “yard” lifting weights and getting jailhouse tats. Compared to this, it sounded like paradise. On the way home, I decided to call the SC DMV and chase down what this “Failure to Appear” was all about. I wish I could sound this out so you could hear it, but it was the most hillbilly sounding guy, bless his heart, that I’d ever heard. But he was very nice, and very helpful. [inside voice] There’s a National Repository? Ugh. GD NSA. I take a moment to reflect on my day thus far before starting to re-deal with the CA DMV. EVEN THE DAMN PHONE LINES FOR THE CA DMV HAVE A 1-2 HOUR WAIT! Blown away, I do the callback thing, and go on about my business. About 80 minutes later, someone calls me. I explain I’m trying to get a CA license, and being told I have a FTA in the Carolinas, when in actuality it is all clear and CA needs to update (This will be the first of three times I have to explain this). …a different automated message. I’m IN! At this point, I’m almost laughing hysterically, as if I’ve completely lost it, and next stop is in the back of one of those old vans, in a strait-jacket, on the way to the looney bin. So, I go take it out on some poor civilians in Grand Theft Auto V. Mind you, I’ve got the volume CRANKED up. As if it were meant to be, as soon as someone picks up, I run over a herd of people that all scream in unison. I quickly assured the guy that I wasn’t killing anyone [yet] and that it was simply the GTA video game.